I am so excited to announce that Teachers Pay Teachers has a big sale going on Monday, November 26th and Tuesday November 27th! Use code CYBER18 at check out to save 25% of everything in my store including Bundles! That means Bundles you are saving up to 55% off purchasing individually. WOW! The rest of Teachers Pay Teachers will be on sale for UP to 25% off as everyone doesn't put their store on sale or picks different amounts. 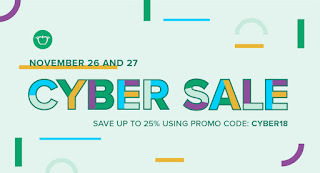 CYBER18 will save 5% automatically even stores who didn't put things on sale. Clicking on the banner will let you follow my store and check out everything! You can also win a $10 TPT Gift Card before noon Eastern on Sunday if you head to my Facebook page and follow the directions! Most of my store is filled with games and centers. Be sure to check out my Christmas, Winter, and Valentine's Day themed resources! In my store you can find my popular Task Cards, Word Boxes, Write The Room, Kindergarten Interactive Student Notebooks, Clip Its, and More!